Asian-inspired chicken skewers and noodles with a refreshing mint and fruit salad. 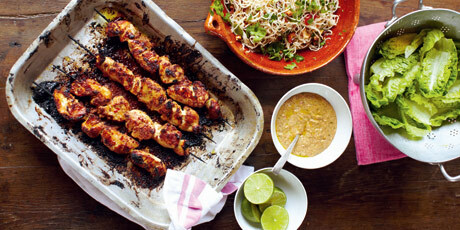 You might also like these Addictive and Delicious Satay Recipes. 1. Get all your ingredients and equipment ready. Turn the grill on to full whack. Lay 4 wooden skewers in a tray of cold water to soak (if they float, use a plate to weight them down). Put the standard blade attachment into the food processor. 2. Put the coriander (stalks and all) into the food processor with the chilli (stalk removed), peeled garlic, 3 heaped tablespoons of peanut butter and a lug of soy sauce. Peel and roughly chop the ginger and add. Finely grate in the zest of both limes, then squeeze in the juice from 1 of them. Add a couple of splashes of water and whiz to a spoonable paste. Season to taste. Spoon half into a nice bowl and drizzle with extra virgin olive oil, put the rest aside. 1. Line the chicken breasts up on a plastic board, alternating ends, and close together. Gently and carefully push the skewers through the breasts. Slice between the skewers to give you 4 kebabs. Thread any stray pieces on the ends of the skewers. To make the chicken crispier you can score it lightly on both sides. Scoop the rest of the satay mix from the processor into a roasting tray, add the chicken skewers and toss with your hands to coat, rubbing the flavour into the meat. Clear away the board and wash the knife and your hands. Drizzle the chicken with olive oil and season with salt. Put on the top shelf of the oven, under the grill, for about 8 to 10 minutes on each side, or until golden and cooked through. 1. Put the nests of noodles in a large bowl, cover with boiling water and a plate, then leave to soak for 6 minutes. Put a medium frying pan on a low heat. Bash the cashew nuts with a rolling pin or against a work surface in a clean tea towel. Add to the warm pan and leave to toast, tossing occasionally and keeping an eye on them as you do other jobs. 2. Peel the red onion half and put in the processor with the chilli (stalk removed) and the stalks from the bunch of coriander. Pulse until finely chopped, then put into a large serving bowl with 1 or 2 tablespoons of soy sauce and a few lugs of extra virgin olive oil. Squeeze in the juice of 1 lime, and stir in 1 teaspoon each of sesame oil and fish sauce. Mix well, then taste and correct the seasoning. Drain the noodles in a colander, refresh quickly under cold water, drain again, then add to the bowl. 3. Toss your cashews and turn the heat under them up to high. Add 1 teaspoon of honey, mixing and tossing the nuts in the pan. Once dark golden, tip them into the serving bowl and add the coriander leaves. Toss everything together and take to the table with the bowl of satay sauce. 1. Trim the bases off the little gem lettuces and get rid of any tatty outer leaves. Click the rest of the leaves off, halving the cores. Rinse in a colander, spin dry, then take straight to the table. Fill and boil the kettle. 1. Turn the skewers over, drizzle with a little runny honey and put back under the grill for 8 to 10 minutes. 1. Peel and slice the pineapple and arrange on a large platter with the blueberries. Rip the leaves off the mint and pound in a pestle & mortar till you have a paste. Add the caster sugar and pound again. Scatter 1 tablespoon of this mint sugar over the pineapple (keep the rest in a small jar in the fridge for another time). Halve a lime for squeezing over, then take to the table with the pot of coconut yoghurt and a spoon. 2. Roughly chop the coriander leaves and finely slice the chilli, if using. Put into little side bowls, take both to the table and put next to the lettuce. 3. Take the chicken to the table with a bottle of soy sauce and a few wedges of lime for squeezing over. Let everyone build parcels of lettuce, noodles, chicken, a sprinkle of coriander and chilli and a squeeze of lime.